Born in Tokyo, Japan, Molly Cochran lived in Europe and was educated at the University of Pittsburgh and the Sorbonne in France. She has written 26 books, including 12 ghosted novels, and the non-fiction bestseller, Dressing Thin, before her own first novel, Grandmaster, was a New York Times Bestseller. 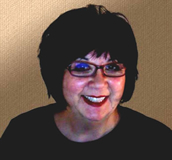 Since then, she has written almost a dozen other suspense and fantasy thrillers, including the international best-seller, The Forever King. Learn more at Molly Cochran’s website. The Forever King — (1991-2003) With Warren Murphy. Publisher: In a darkened house not far from the place where Camelot may once have stood, a madman schemes, plotting toward the day when he will wrest the cup that men call the Holy Grail from the boy who is its guardian. Arthur Blessing is no ordinary ten-year-old. The Grail is his by chance, this time, but the power to keep it — a power as ancient as time itself — is his by right. Now he must stay alive — battling foul sorcery and indefatigable assassins — long enough to use that power. 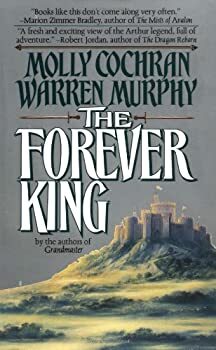 The Forever King, by Molly Cochran and Warren Murphy, is almost two books blended together. One is an unusual take on the Grail legend, with some familiar characters like Merlin and Nimue. The other is a contemporary fantasy thriller about the reincarnation of King Arthur and a drunken ex-FBI agent who must help him. The Grail retelling has the most chance of being successful but ultimately both stories fail because of poor characterization and clichéd writing. The book, published in 1992, is the first of three in a series. Legacy — (2011-2014) Publisher: When her widowed father dumps 16-year-old Katy Jessevar in a boarding school in Whitfield, Massachusetts, she has no idea that fate has just opened the door to both her future and her past. Nearly everyone in Whitfield is a witch, as is Katy herself, although she has struggled all her life to hide her unusual talents. Stuck at a boarding school where her fellow studens seem to despise her, Katy soon discovers that Whitfield is the place where her mother commited suicide under mysterious circumstances when Katy was just a small child. With dark forces converging on Whitfield, it’s up to Katy to unravel her family’s many secrets to save the boy she loves and the town itself from destruction. CLICK HERE FOR MORE BY MOLLY COCHRAN.